Does it take long to get yourself a 3D printer? Is it difficult to use a 3D printer? I3 here and Prusa, Prusa i3 there… Well known, great community, I'll take one! I run my impression and I sleep / to the market. Can we make a break? The plastic, is not dangerous for health? 2 heads, 2 times faster? How long lasts an impression? For some time now, I am the happy owner of a 3D printer. One of the we build from A to Z (DIY = Do it Youself), not one that is already built and or simply just put a filament and a file to print, and hop, go! Because I get asked a lot of questions about these 3D printers, I thought I'd write an article with the most frequently asked questions and their answers. Yes and no. Personally, taking my time, reading of the instructions in order not to lose me, I got 1 day and 2 afternoon. With experience, I think I can easily go down this time in 1 day if necessary or even less, for any printer of the same type. Using a 3d printer is not really complicated, it's just that there are a lot of parameters to be taken into account. Besides, there is a golden rule: make a change at a time! And sometimes it's tedious, especially when you have to calibrate the 3D printer. Well Yes, the 3D printer requires a calibration, but once made, 3/4 of the calibrations will no longer need to be redone. If I say 3/4, it is because the 3D printers, sometimes will require recalibrating from time to time things like the distance between the bed (base) and the print head. And unfortunately, these calibrations are quite thorough, you should know that the printer out of the sons of the order of 0.1 to 0.4 mm in General! Which means that a calibration with a millimeter of deviation from the expected value can be a problem! Well it depends on, I'll say it's a bit like smartphones: you have 100-150 euros 3D printers, and those 1000 euros or more. (I refer of course to the domestic printers, because there are far more expensive). 3D printers are starting to become more democratic, so gradually the price will go down, I think. Note that a 3D printer requires (generally plastic, PLA or ABS), filament just like any printer inkjet ink needs. The price of these filaments depend on their quality, colour, their properties (flexible for example), etc… But in General, for example, for the classic PLA, all confused colours, I'd turn around 20-25 euros per kilo. (As for everything, you have the cheapest and the most expensive, sometimes double the price!) But be aware that for 1 kilo of filament, you can rest easy for a good time! 1 kg is about 330metres of filament with a big ladle. I often read some advised such or such printer because it can get better and that there is a community behind. Don't focus on it, a community behind is important, that there is not to say, however, the improvements… The improvements you are offered, these are improvements that you can print with your 3D printer. Isn't this wonderful? Nothing you can do with your printer, auto-améliorer it! Yes… except that improve it, to first that she can run a minimum! It's just stupid, but it is logical and many people forget it! I also had the case with my 1st printer technical service, I had a problem on one of axis, they gave me as solution to print a piece of clear to see if this resolved the worries… Bah Yes ok, but how do I do if my printer does not want to move because of the problem on this axis? If you print a piece to enhance your printer because it prints well, how do you think this room you are going to print can improve the printer while it by default is not well built? (After all depends on the importance of the problem and the importance of the piece) In addition, any improvement is not necessarily needed. All printers are not the same, and still less configuration. You'll almost always 2 improvements to be implemented: the anti-wobble (kind of vertical waves that are created) and ventilation to add to cool your room. Many have demonstrated their usefulness, and I believe them, but home, tests showed that my printer is 2 improvements were not really necessary and for one of them, instead printing empire! Home 3D printing technology is recent, so it is quite normal that the majority of the resources are in English. You will more easily find solutions to your problems in English and in french. To mount a 3D printer? Okay, you can buy a whole mount, but it will cost much more expensive! Bad idea! It is quite safe to leave unattended 3D printer! First and most important: it can catch fire! Heating head heats up to 200 ° continuous, but well, except for the plastic that it melts, it should theoretically touch anything other. On the other hand, your son can start your engines heat and FRY your card! And believe me, the risk of is on fire in your home is not zero! I had the bad experience to have had (presumably) a blocked (2 times!) fan, mini fan, 4cm square. It's not much, it's tiny and it consumes very little. 1 h later, white smoke and the cable burned completely! The wire so heated that it is cut into 2! Fortunately I was nearby and that I saw because saw that it was a fan which cooled the motherboard, and so it began to heat up also! In addition, fortunately my cables were scattered and in height, and so it didn't hit anything other, but it is easily conceivable that the heat from this overheated wire was able to burn something and fire spreads! Casually, even when it burned the sheath that enveloped the wire! Second, less important than the fire for some reason X, Y or Z, printing may very well start, but in the Middle, printing fails a check mark, and hop, your impression is completely screwed! If you're in the vicinity and that you look at from time to time, you will see it and stop printing, or set the worries. But if you're not there, the 3D printer will continue as if nothing was, except when there is a temperature problem, and will continue to move his head and out of the filament. In the end, you will have a beautiful ball of useless plastic. Yes and no. The breaks on ongoing impressions is possible but may cause problems on the parts: head heats continuously and as long as the head is at the right temperature, the filament will be released… What will your impression because of the filament would be deposited there or should not be! A break with the head outside the print area? Yes, possible, but according to the duration of the break, your print will cool, and plus your room cool down, you can see a difference between the front area and zone after the break because instead whether a merger between 2 warm layers, it will become a merger between a cold and a hot layer. The PLA and the ABS, are not toxic. But the heating of these materials cause of many fine particles which are dangerous to health. So much so that some advise to put a hood especially if working with ABS! The PLA is less fine particles than the ABS. This health hazard is little known and is not listed in the instructions (can we really call it a record?) 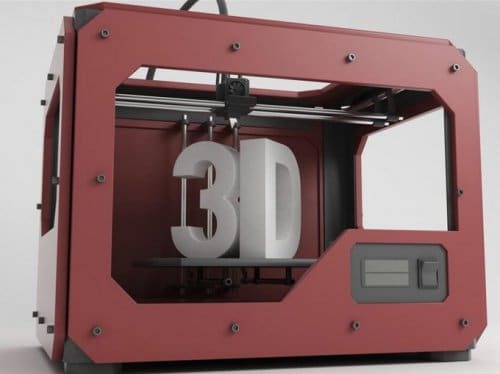 It is usually manufactured in China, you don't really have what can be called a record, you rather sheets stapled as a notice) because of the youth of 3D printers in the houses. and is not really regulated. It's a bit like smartphones, that them I would say, are older than the 3D printers and more present in our daily lives, but it is still unclear if they can cause cancer or not, if they heat up the brain, an egg etc… There's still a couple of years, was not at all of the standard DAS, which is the specific radiation absorption rate, it is only now that we made a little attention. There are 2 heads 3D printers or more in order to manage more easily 2 colors or 2 different materials. -What does it faster? Yes and no, because 2 heads are on a same axes and therefore move at the same time. If you print 2 towers at the same time and the 2 towers are separated by the same distance that the 2 heads, you win no doubt time if he had done the 2 towers with a single head. But if you print one piece or your 2 pieces are a different distance the distance between 2 heads, saving time is much less! Double extruders are there mainly to print 2 colors or 2 different materials, not to save printing time. It depends on many factors. It varies strongly according to the parameters: for a model specific, according to the machine and settings, this can go from single to triple or even more! In General, consider that it will take hours to print a few things! Of course you can print objects in 5-10 minutes, but they are usually very small. For parts of 1-2 cm high with a certain design, consider minimum 30 min. For larger pieces, more complicated, requiring more strength, etc… count the hours and in some cases, even days! And, if you have any other questions, do not hesitate, I'll try to answer them to the best!